[10-07-2018] Our new album called "Here we are, where are we" is released. Finally! Again a variation in songs and spheres. They tell one story which form a kaleidoscopic unity. Sleepwater again have a number of guest musicians to complement the songs. The arrangements are frivolously coloured with keys, the ever existing pedalsteel guitar and of course the backing vocalists who sing like nightingales. Here we are, where are we is a wondrous americana-guitarpop album with songs you can't get out of your head. [02-04-2013] On ThePostOnline.nl you'll find this review of Sunwritten by Tjeerd van Erve, who dreadfully missed out on our concert in Extase, Tilburg. A tale of a deceptively quiet countryside, rural sounds, shifting sandhills, miserably lingering trombones, lost souls and old beer. Nice words, Tjeerd! October 26th offers you a new chance to see us in Extase. Read the whole review by Tjeerd here. Read the whole review by Fred Schmale here. Here you can read the whole review by Mirjam Adriaans. [20-02-2013] Sleepwater cares for the Folkwoods festival and is happy to participate at the Folkwoods Benefit Festival. The festival is to take place on sunday, March 31 at the Temporary Art Centre (TAC) in Eindhoven. The festival starts at 14.00 and does not end until 23.00 hours. Sleepwater are playing at 21.30 hours. The benefits of the day are entirely for the Folkwoods Festival. [03-02-2013] 3voor12 was present at our gig at Café Extase in Tilburg and thought it was an impressing performance and a true treat for the patient music lover: "With the help of a number of special guests on pedal steel, flute, keyboards and tambourin the authentic guitar rockers of Sleepwater delivered a relatively calm, but impressing performance at café Extase, that ended in a memorable climax by drums en strings." Read the whole review by Wouter de Waal here. [24-01-2013] On sunday, February 24, Sleepwater are playing live at Omroep Brabant radio. The band is playing 2 songs acoustic at Weekendmol, the radioshow by Hubèrt Mol. Listen between 15.00 and 15.30 hours. [07-01-2013] That's another good reason to come to Plein 79 in Den Bosch next sunday: this review by Benny Metten on Ctrl.Alt.Country. Too many superlatives to choose one! Well, okay: "With an awful lot of confidence they create an extraordinary Sleepwater sound". The rest is up to you. See you sunday at Plein 79! [02-01-2013] On sunday January 13th Sleepwater will be performing live at Plein 79 in Den Bosch. A warm welcome to everyone to join us and celebrate the start of a new Sleepwater-year with us. Plein 79 can be found at Markt 79, Den Bosch. Showtime 17.00 hours. More info to be found here. [01-01-2013] For all our friends and fans (ok, for everyone) a splendid and music minded 2013! We are kicking off the year with the release of our new video 'She's Gone'. Think it's different? You can find the video on our Music & Video page and, of course, on Youtube. Enjoy! [31-12-2012] Sleepwater starts the new year as Band of the Week at MusicfromNL. A great start to a brilliant 2013!!! Sleepwater in Music Maker: 4 stars!!! [20-12-2012] This review can be found in Music Maker #1, 2013. We really have nothing to add tot these brilliant words. We wouldn't dare! Click on the picture to get a larger and readable format. [10-12-2012] Musicfrom.nl's Marcel Hartenberg refers tot the rich history of music by dropping names of the likes of Neil Young, Lou Reed, The Beatles and Fatal Flowers in a splendid review. "Sunwritten is like a book with multiple layers (...) Sleepwater serves a varied meal and does it superbly (...) Although the album comes to us in the late autumn, it's bursting with life." Does it ever stop??? [07-12-2012] According to Johnny's Garden's Rein van den Berg, Sleepwater is a pack of quirky, tough guys who, nevertheless, have a sensitive side. Besides, he manages to decompose the love life of the Sleepwaters, like only a true psychologist can. As for the music: "This new Sleepwater album confirms that serious homegrown music is ready to claim its stake (...) they're able to compete with their foreign musical collegues". Go, Johnny, Go! [05-12-2012] The Sunwritten review by our Belgian friends at Bealestreet.be makes us super proud! "Class with international potential (...) Everything at their disposal to make musical history (...) Sleepwater on the verge of an international breakthrough". Way to go, Swa Braeken! You made our day. [03-12-2012] Machiel Koehorst is the next in line to listen to Sunwritten. He writes about it on 8weekly: "Sleepwater doesn't fear any adventure (...) The songs on Sunwritten are put together very cleverly, the tinkling guitars and delicate harmonies are tumbling over each other and the addition of flute, trumpet and trombone is a big plus (...) a great homegrown roots album with lots of musical ingenuity"
[01-12-2012] December already, and that means: time to make up the year lists! Ok, the december lists, that is. For Sleepwater this means, preliminary score, no less than two top ranks: at Ronsaltcountry we find Sunwritten at the very top: number 1 in the December charts! Or are we being too modest and should we say: NNNUMMBBBERRRRR......ONE!!! Don't forget to read what Ron, uh Leo, writes about the album: "What a magnificent record". And, as if this wouldn't be enough satisfying, Sunwritten is placed number twenty in the Euroamericanachart! In good company, too. Would we make it to the final year lists? [26-11-2012] Yes, outside Holland as well Sunwritten has started to get some attention. And this time it's our Belgian friends at Rootstime.be, where Valère Sampermans is flattering us with these sentences: "Songs that show the evolution the group and their singer-songwriter have gone through in their music (...) If Sleepwater would mean moveless water, we couldn't deny the group with this name any progress (...) This second CD "Sunwritten" is an important step towards success". And there's also the invitation for a gig in Belgium. We're happy to stop by, Valère! Review on Kindamuzik: a warm blanket! [21-11-2012] We are getting spoiled a bit by reading all those praising reviews. On Kindamuzik.net Niels Steeghs writes us straight into heavenly atmospheres using the following words: "Exciting, brooding, melancholic, painful, raw and honest. And sometimes just having a nice flight off the road" / "With a special attention to a multitude of sounds and influences, Sunwritten wraps itself around you like a warm blanket". Quite a tasty review! And poetic too, right? Third review for Sunwritten: four stars for "simply great Dutch alt.country"! [16-11-2012] Four stars on Altcountry.nl! And, yes: that makes us superproud, especially considering the fact that there are only very few bands that go beyond that. 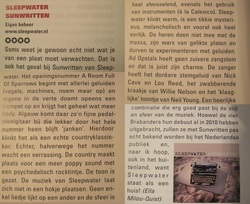 And what exactly does reviewer Wiebren Rijkebroer write about the album: "fantastic laid back alt.country that, strangely enough, sounds typically Dutch, but also reflects Richmond Fontaine and Calexico" / "extremely fine countryrock songs that are instrumented extremely fine as well" / "Sunwritten is simply great Dutch alt.country". Think we've got a fan there. [15-11-2012] 8weekly.nl has published an extremely fine review on the Sleepwater concert in Moergestel. Before the gig, the reviewer had his doubts wether the band would be able to approach the quality of the album on stage, but after it he clearly noticed that "the band equals the album on stage". We also quote: "the enthusiastic band is literally blasting away the large 'Boogaard' stage" / "the drive of the stage is being fired up by the enthusiasm of the audience" / "Sleepwater has awakened". Second review for sunwritten: international allure! [11-11-2012] Review number two is really blasting us away! 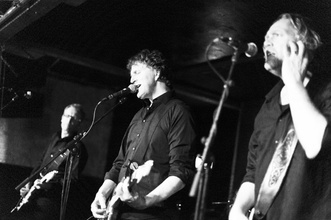 On Altcountryforum.nl Johan Schoenmakers describes the music on sunwritten using the following words: "a remarkable growth in the band sound" / "an unpolished sharpness of absolute beauty" / "the listener is transferred into another dimension" / "with sunwritten, sleepwater succeeds in delivering an album of international allure". You're welcome, Johan! First review for Sunwritten: RELISHING! [28-10-2012] The first press review for Sunwritten has appeared on Wordpress.com, written by music blogger Joost Festen. Some phrases: "With Sunwritten, Sleepwater delivers a mature album, that can easily compete with a number of established names" / "My only conclusion: it's beautiful!" / "Sunwritten is simply relishing!" [27-10-2012] Today we have our own Sleepwater cd release party for everyone who contributed to Sunwritten. On a fantastic location in Moergestel, with a perfect view on 'Den Boogaard'. Could we be more appropriate? [17-10-2012] The second Sleepwater album is up for grabs now. Its name: Sunwritten. And: it's beautiful! To celebrate this, Sleepwater are giving away free Sunwritten copies. We raffle free albums amongst everyone, who likes and shares our website or who leaves a message in our guestbook: we couldn't make it any easier for you! But… there are other ways to get a free Sunwritten copy as well. Go to the Gratis CD page and read all about it. Winners will be informed immediately after our album release party on the 9th of November in Moergestel. [26-09-2012] Yes, it's done! The second Sleepwater album, containing eleven new songs, is born. Its name: Sunwritten. All compliments to the more-than-proud parents are welcome. First, unofficial feedback from the league of music blogging Holland: "Yesterday and today in my car I listened to Sunwritten over and over again, right now the songs are coming out of my stereo at home. What a treasure. It's beautiful!" And here's something for your calendar: on november 9 Sunwritten will be officially baptized at Den Boogaard, Sint Jansplein 5, Moergestel. Want to order a copy already, so you can sing the songs with us on the 9th of November? No problem. Send an e-mail to sleepwater@live.nl and for € 10,- + costs you will receive your Sunwritten copy as soon as possible. [16-09-2012] On Friday the 21st of September, Sleepwater will be performing live at Kraaijenbalder in Eindhoven. For all music lovers it's the first opportunity to hear some songs of the soon to be released new Sleepwater album. Kraaijenbalder, Strijpsestraat 79, Eindhoven. Showtime 21.30 hours, free entrance. For more information, click here. [24-06-2012] Director Brenda van de Ven has finished the shooting of the second Sleepwater video. The video was shot for the song Shadow Of A Smile, one of the tracks from the forthcoming second Sleepwater album. Both video and album are set to be released in the autumn of 2012. [10-06-2012] In a sunwritten Kloosterpark in Schijndel Sleepwater has kicked off the 1 Ander Festival 2012. With guest stars Peer Desmense and Fred van Gennip Sleepwater played a fine selection of songs of their first and soon to be released second album. The sunbathing crowd was enthusiastic and made that clear. Watch the photos on the Sleepwater Facebook-page and in the gallery section. Soon reaches one thousand views! [16-03-2012] The video Soon appears to be a success. Today, merely a month after its release, the number of views on Youtube has reached one thousand. Two thousand, here we come! [08-03-2012] Sleepwater drummer Martin de Ruijter spoke to the 'Brabants Dagblad' about the videoclip Soon. The interview was about the area where the clip was shot and the meaning of it all: "We wanted to pay tribute to a beautiful piece of Udenhout, while it is still there". The article appeared in the Brabants Dagblad of the 8th of March 2012. Read the whole interview here or visit our Facebook-page. [01-03-2012] Sleepwater have been confirmed for the 1 Ander Festival in Schijndel on Sunday, 10th of June 2012. The band is playing on the Main Stage at 14.00 hours. The 1 Ander Festival is to take place on the 9th and 10th of June in the Kloosterpark, Schijndel. [07-02-2012] The Sleepwater video for the song Soon was officially released on Youtube today. Soon is taken from the first Sleepwater album. Director Brenda van de Ven has done a tremendous job directing and editing the Soon video. Watch the video under Music & Video or click here. [09-12-2011] Sleepwater have started the recording of their second album. Produced by Sebastiaan van Bijlevelt (Okieson) and Theo Liebregts (Chalkmill Road), the first recordings of the successor of the well received debut album Sleepwater have been successfully finished. The album is to be released somewhere in the summer of 2012. [05-11-2011] Sleepwater have finished the shooting of their first video. The shooting for the song Soon took place in and around Udenhout, hometown of the boys, and was directed by Brenda van de Ven, who is also in charge of the editing part. The release of Soon is to take place at the start of 2012. [20-07-2011] Sleepwater were impressive at Radio Zuidplas, where they performed live in the studio at the 'Taste of Music' show. Sleepwater were playing no less than eight songs, thus showing their professionalism and versatility. "The Sleepwater-party at the studio was clearly audible on de radio", was one of many comments. Sleepwater are gratefully thanking Marco Geene and the complete Radio Zuidplas team for a friendly reception, the enthusiastic reactions and, off course, the delicious snacks. [12-07-2011] sleepwater are preparing for a live radio show on Tuesday 19th of July at Radio Zuidplas. Between 20.00 and 22.00 hours sleepwater will perform eight songs in the 'Taste of Music' show of Marco Geene. This time sleepwater will play without guest musicians. Listen online here. [26-06-2011] Sleepwater have been playing for an enthusiastic crowd on Saturday 25th of June at 'The Kiosk' in Loon op Zand. Following a melodic support act by Hazey June, Sleepwater not only played the songs of their debut album, but also performed some new material and a few unexpected cover songs. At the concert Sleepwater were assisted by their regular guests; Libby Gould (violin), Ruurd van der Vegt (flute and harp) and Peer Desmense (pedal steel). The whole resulted in a very special debut concert by Sleepwater. The large crowd enjoyed it the whole ninety minutes en showed their appreciation loud and clear. [18-06-2011] Peer Desmense, Ruurd van der Vegt and Libby Gould are joining Sleepwater at the album presentation on June 25th in Loon op Zand. Peer (pedal steel), Ruurd (flute, harp) and Libby (violin) also played their part on the album. Sleepwater are delighted that all three are contributing.